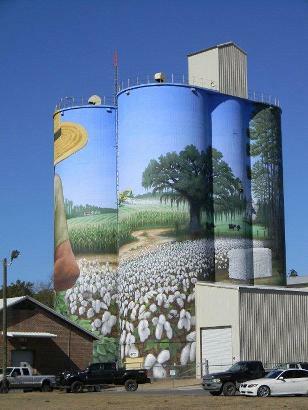 You’ll probably see Colquitt’s most ambitious mural before you get inside the city limits. If you don’t, you’re blind and should surrender your driving license. 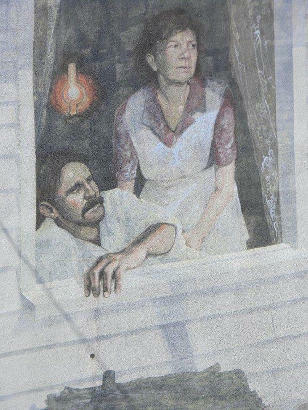 This mural avoids the rude “in-your-face” theme – usually employed by graffiti artists – by having the human element face toward downtown. 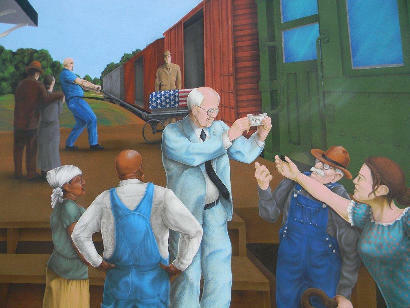 But make no mistake, the peanut farmer depicted could really get in your face if he wanted. He could get in Godzilla’s face, if he wasn’t so concerned with his peanuts (which are the actual size of your average Wal-Mart shopper). This beautiful mural, by artist Charlie Johnson looks like the result of a discussion between César Chavez and Georgia O’Keefe. Despite it’s being on a peanut silo, cotton and cattle are also shown, as is a crop dusting plane. 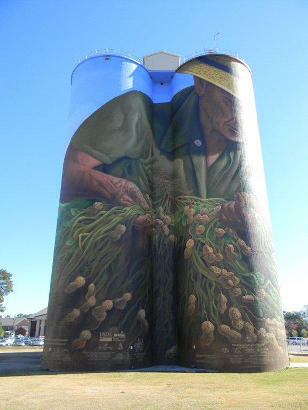 The Birdsong Peanut Company donated the skin of the silo (they weren’t using it anyway) but they deserve a tip of the peanut farmer’s hat for not insisting on the inclusion of their name. 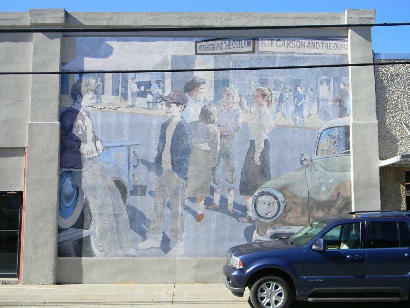 The mural is a late entry in Colquitt’s well-established Millennium Mural Project. You can round the mural thanks to a church parking lot and city streets. Credits and sponsors are found under the peanuts on the mural’s north side. The city of Colquitt has also provided a downtown garden (SE corner) of peanuts and cotton as an educational display. It could be considered a nostalgia garden for people of a certain age who were once intimate with peanuts or cotton – as a lot of Georgians are. 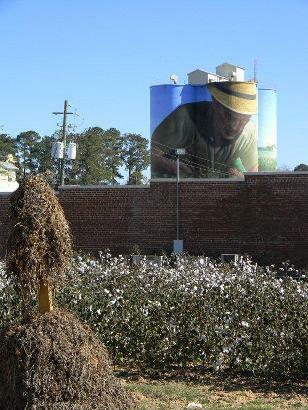 As impressive as the peanut mural is (It’s properly known as a Agricultural Icon Mural), downtown Colquitt offers more art, many of them excellent, although sadly, some of them are already fading. One of the more mysterious murals is one of a man sitting behind a desk, reviewing memorabilia that seems to revolve around Alcatraz prison. 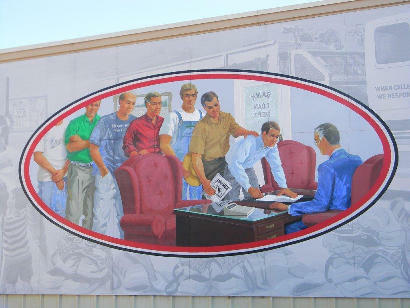 Several of the murals depict local legends and landmarks. 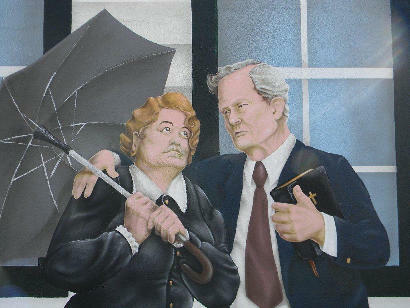 Based on the candor and posing of subjects, several appear to have been adapted from photographs. 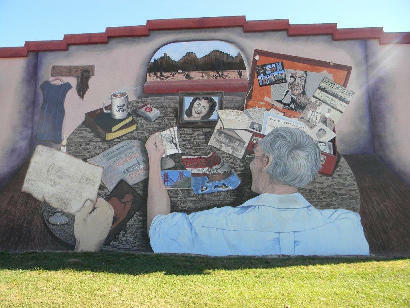 Mural Depicting Colquitt in the 40s - curious about the man with the dollar bill? So are we. The Colquitt Volunteer Fire Department takes out a loan to purchase "Jaws of Life"
I would like to take a moment to state my appreciation for being able to contribute to Texas Escapes, and would like to thank the management, who graciously overlooked the long contentious relationship between them and brother Luke and still co-signed for my new truck.